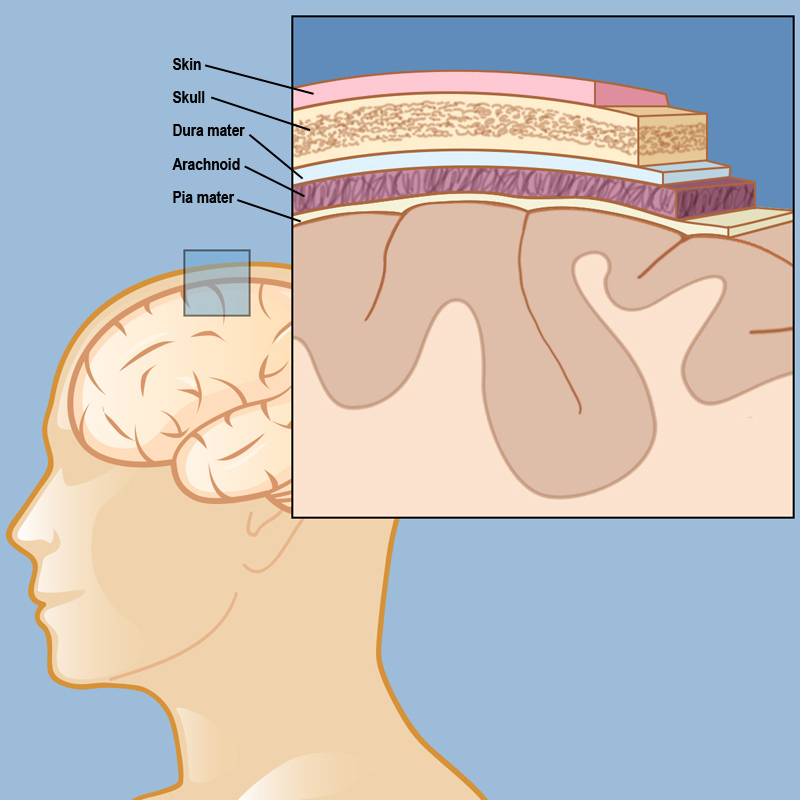 The meninges consist of the dura mater, the arachnoid membrane, and the pia mater, which lie directly below the skin and skull. A meningioma is a tumor that develops in one of the protective layers around the brain and spinal cord, called the meninges. 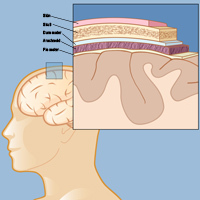 The meninges consist of the dura mater, the arachnoid membrane, and the pia mater, which lie directly below the skin and skull. Since the meninges cover the entire brain and spinal column, a meningioma can develop almost anywhere. A meningioma is the most common type of primary brain tumor in adults, striking all age groups (but typically between the ages of 40 and 60), and developing in women more often than men. About 90 percent of meningiomas are benign and slow growing (grade 1 on the World Health Organization’s grading scale), but that doesn’t mean they’re harmless. As they grow even benign tumors create pressure against the brain tissue, nerves, and blood vessels and cause symptoms. The good news is that, with proper treatment, a benign meningioma has an excellent five-year survival rate (see Diagnosing and Treating Meningioma). In the small number of cases when a meningioma is atypical or malignant (WHO grades 2 or 3), the prognosis is more guarded, with a higher incidence of recurrence after treatment. For most patients with meningioma, a comprehensive treatment plan that includes surgery and follow-up treatment can effectively cure the tumor (see Surgery for Meningioma). Here at the Weill Cornell Medicine Brain and Spine Center, we excel at providing the most advanced skull base techniques to ensure maximal removal of the tumor and the neurologic safety of our patients. Some meningiomas are in challenging locations that require advanced neurophysiological monitoring to protect certain neurologic functions like facial movement, hearing, and swallowing. Other meningiomas may be wrapped around critical arteries of the brain, requiring multidisciplinary management. Finally, some patients have already had meningioma surgery elsewhere or have had radiation and come to us with recurrent disease. It is these types of complex tumors that bring patients to the Weill Cornell Medicine Brain and Spine Center. In addition, we are actively investigating the ability to personalize drug therapy in patients with multiply recurrent atypical or malignant meningioma by studying the genomics of individual tumors. Please contact us for further information on this exciting new direction in meningioma therapy. Researchers don’t completely understand what causes the cellular changes in the meninges that cause a meningioma to develop. There is some evidence that exposure to radiation (for example, for treatment of an earlier cancer) may increase the risk of developing a meningioma.